The completed sections — like this one next to the Peninsula Park pool — have made a dramatic change to the street. The City of Portland plans to get work started again this weekend on the North Rosa Parks Way project. The repaving and lane reconfiguration project began in early May and was mostly complete by mid-July. 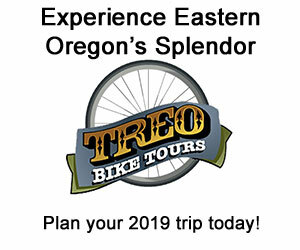 But there are three sections of the two-mile long project that are unfinished: from Delaware to Interstate, from Williams to Martin Luther King Jr. Blvd, and the I-5 overpass (which is the State of Oregon’s responsibility). This situation means that road users must switch between the old (standard door-zone bike lane) and new (parking-protected bike lane) configuration. As we reported back in June, PBOT left two sections untouched because the pavement was good enough to keep and they didn’t want to damage it with their standard method of grinding off the existing striping, so they hired a different contractor who uses a water-based method. Now they’re ready to go and PBOT says the work on those final two sections will begin (and will likely be completed) this weekend. 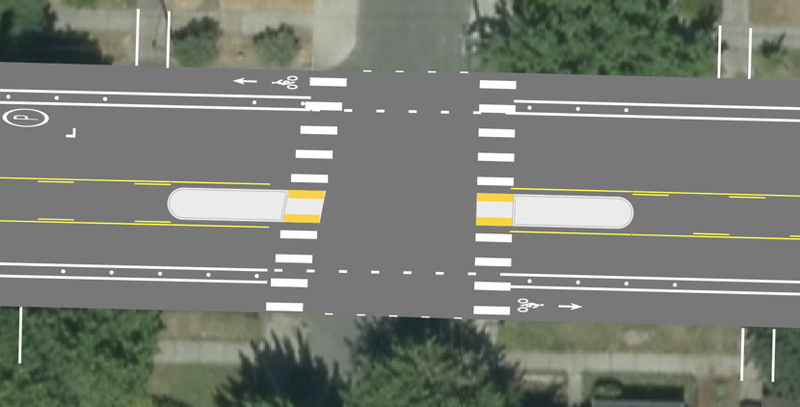 Final design of new crossing treatment coming to N Villard Ave is not as beefy as PBOT wanted it to be. PBOT has also shared final design drawings for the project. The drawings reveal that the City’s proposal for a more robust crossing median at N Villard have been abandoned. In May we shared how PBOT wanted to build a more robust median island at Villard (a very popular traffic cut-through street) that would prevent people from driving north-south through the intersection. 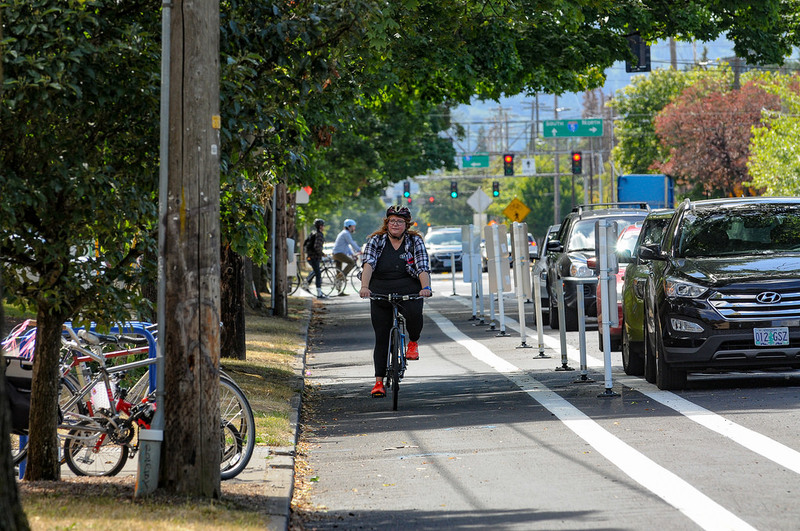 The City’s preferred design would have provided, “increased protection for people walking and bicycling,” according to the PBOT project manager. I’ve asked PBOT to explain why they don’t plan to move forward with the full median and will update this post when I hear back. 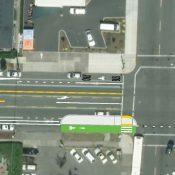 We were hoping to see a concrete floating bus island at the Albina intersection to prevent bu operators from pulling into the bike lane; but it’s not shown in the final design drawing. It also looks like PBOT will not pursue a floating bus island at the stop on the southwest corner of Albina and Rosa Parks Way as initially planned. 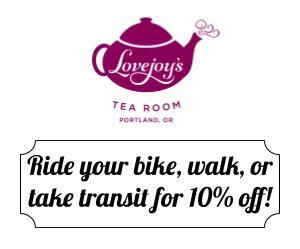 Last we heard PBOT was working out kinks on the design with TriMet. Meanwhile, ODOT’s I-5 overpass section is a mess. Not only has it lacked complete lane striping since the repaving was done in May; but now a separate project to rebuild curbs at the on-and-off ramps has created a work zone that forces bicycle riders into a shared lane environment. We’ve asked ODOT for an update and timeline and will share that information once we hear back. This is a bike-only lane — not a right-turn lane! The wider bike lane has made the street safer for everyone. – Driving speeds are way down now that people have one fewer lane to use and they have to pay attention to avoid hitting parked cars that are floating in the street (instead of hugging the curb). – People are also doing a much better job parking in designated spots instead of the bike lane now that PBOT has completed the striping and signage work. – Right turns off Rosa Parks are still a problem. Many people drive into the bike lane prior to the intersection, which is against the law. It’s a bike lane, not a turn lane! I’d like to see PBOT create stronger designs to prevent this behavior. A few more plastic wands or a cement curb would do the trick. PBOT might also consider a “BIKES ONLY” pavement marking. Have you ridden the new bikeway on Rosa Parks? What do you think? 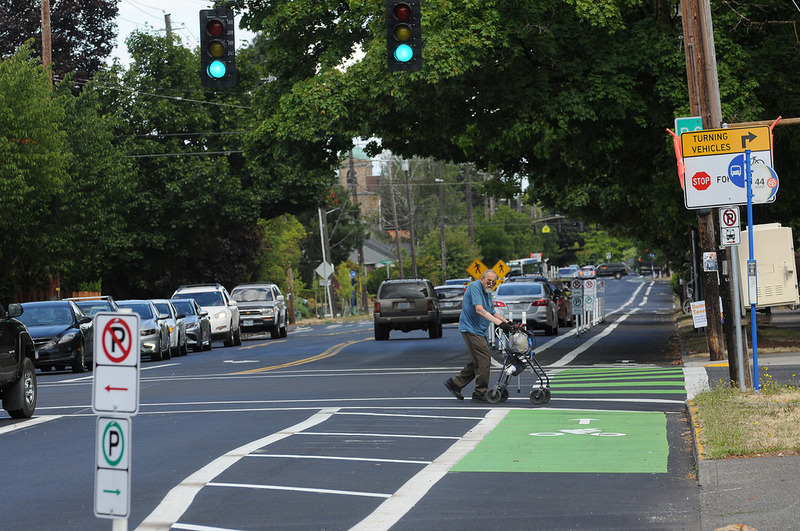 The last couple of photos show PBOT’s unintuitive signage. Why do any green parking arrows point toward the bike lane, and why do they change from post to post on the same block while the lanes remain the same? It’s just a little joke from PBOT to keep us on our toes. It’s been called out many times. We can only assume that it is intentional at this point. They don’t point toward the bike lane, lest regular parking spots not next to parking-protected bike lanes would be pointing toward a parking spot on the sidewalk. These are the standard signs used throughout the city (and elsewhere in Oregon). They point forward or back in reference to the sign’s location. Parking from “here” to “here” is the information communicated between two signs.Same goes for no parking signs and loading zone signs. They’re cheated out slightly (not perfectly parallel to the lane) so they can be read from the driver’s position in the auto lane. I rode just one block from Williams to Vancouver yesterday. The signage is not consistent with this explanation. I actually emailed PBOT on that topic and was told that the signs are correct. The arrows are point backwards (indicating no parking) where there are crosswalks. I mentioned that this was hardly intuitive and that there were too many things giving directions (the street signs, the parking paint and the cuts in the sidewalk)…and that perhaps it would be more intuitive if they simply painted the no parking areas yellow by the cuts in the sidewalk (indicating a crosswalk – but no crosswalk paint). Quite simply, there are too many things attempting to provide information in a small area for anyone to make easy sense of it. These are the same signs used literally everywhere in Portland. Why are they only confusing here? Because successive signs point in alternating directions without any other obvious indications as to whether or not it is okay to park. It would be even more confusing if they changed the signage. Now, that said, I think the arrow pointing that ODOT uses with the titled signs is more confusing than what California uses, which is simply the phrase “from here” and “to here”. Granted, that’s less international, but it is more explicit and less open to confusion to newcomers to the arrows. That said though, I really think you’re being silly if you say they’re more confusing in one context than another. Consistency is key in sign standards and it’s appropriate to use the same signs they use everywhere else. A clearer separation between the parking lane and the bike lane would be more key — that is, a barrier that provides a “curb” for the cars. Well, you asked a question: Why is it different? I believe I pointed out a significant and understandable difference in the current usage. Calling me “silly” for disagreeing with you is probably not helpful. But it’s not different! There is nowhere in OR where you can park inside the plane of regulatory signs. You always must park between the signs and the roadway. If that confuses you, I worry about your driving and anyone else that is confused by it. There is also a LACK of additional dimension – yellow lines. I drove by it again today – some crosswalks have the actual markings going across the entire street and some don’t. There simply is not much consistency with the markings…and road users need consistency in signs and signals. Amazing! They finally found a substitute for the grinder! As a resident on N. Villard, I was never in favor of the full median. 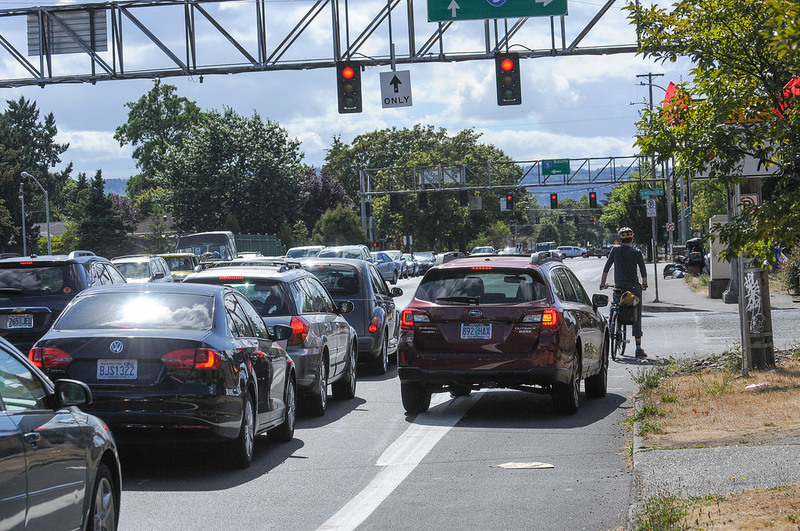 I’ve seen how they installed the full median at N. Willamette and N. Greeley, and I do not feel safe using it as a cyclist during rush hour due to the angle one must be at to enter the crossing and the aggressiveness of drivers. I prefer the bike box at N. Killingsworth. And the full median would have done little to cut down on the insane amount of cut-through traffic we see, as I’ve noticed most of it is coming off of east bound Rosa Parks, seeking to bypass the right-turn (and backup) on N Greeley. I have mixed feelings. The bike lane worked for me, but i can understand why some prefer the parked car protection. What does cause me stress that I didn’t have before, is how close the parked cars are to the intersection, causing a fairly sharp, awkward turn right before popping into the intersection. It’s fine if you’re already slowing to a stop at the light, but if you’re traveling across mid light-cycle, you have to slow way down to make the manuever and then you hope a car isn’t turning right because you’ve been hidden to the last second. 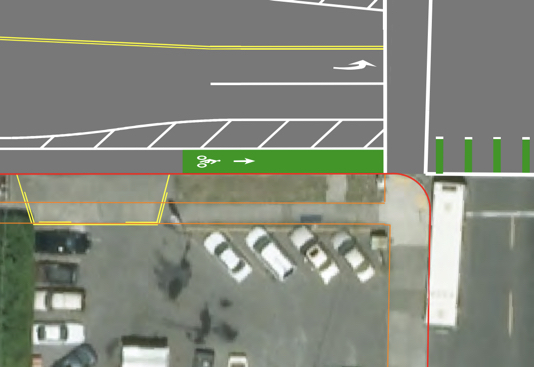 If there aren’t car parked in the parking zone, I’m nearly always popping out of the new bike lane into the parking zone as I approach the intersection so that I don’t have to make the awkward jog- which I’m sure is not what the engineers intended. I most often do this heading west on Rosa, crossing Vancouver. Seems like PBOT been using the “right turn car lane to the left of the bike curb lane” configuration a lot recently, when this used to be a non-Portland type road design and wasn’t used much at all around here. I think the traditional Portland design was that right turn car and bike lanes swap to the curb 50 feet ahead of the intersection. Whenever they put the new style car turn lane outside (away from the curb) of the bike lane, you see many drivers just take the bike lane, anyway; or, turn across the bikers and right-hook them. Not to mention Tri-met bus conflicts, also. I always like to see through bike traffic officially routed to the left of all the turning and stopping lanes for cars and buses at these newer, larger intersections with multiple lanes. Consistent design plans seem to be a thing of the past, and every intersection is an opportunity to create a new design concept (or at least one that’s different from the others in the area). Routing through bikes to the left of the driving lane is simply dangerous design. The problem with Rosa Parks is that the bike lane needs curbed protection at intersections. 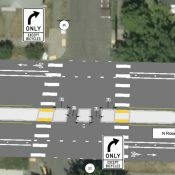 What would really resolve this is an Amsterdam intersection, which they are actually trying out for the first time on West Burnside around 18th or 19th. That design is FAR superior to anything else mentioned. In continued extended timeline, the project page now lists late 2018/early 2019 for “Pedestrian crossing improvements at NE Rodney and N Villard” and “Installation of concrete traffic separators in the bike lane buffer area.” While I wish it would happen sooner, I’ll gladly wait for a few extra months if waiting means real bike lane protection. Ive loved the 1st round of changes that went in a couple of months ago. Our kids rode on the sidewalk before the changes, now they use the separated cycle track and the buffered bike lanes. I’m really looking forward to the completion of this project. Sorry I know it’s off topic but does anyone know if there are any future plans for Ainsworth? City bikeway, future in-road facility (bike lane or greenway), nothing in the pipeline. I feel like someone driving a car that’s invisible to me because it’s exactly the same height as all of the parked cars is going to turn right in front of me or into me. I know there are buffers between parking and intersections but it’s still a big reduction in amount of time I get to predict someone’s movement. I like it better than it was. I wish they cut the parking off a little sooner before intersections. 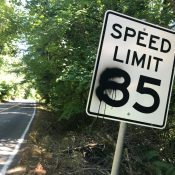 ODOT’s project is a mess. While it will create better ADA options its a nightmare right now, no real way for anyone who is not able body to cross at many intersections. It looks like they built temp ramps but they are often blocked. In other news I got a letter from PBOT saying project on N Denver is on hold. Said the plan was from protected bike lanes but their were “concerns”. I need to email the PM and find out what the problem was (i’d bet a few people yelling about parking). Any insight? So I came across this at intersection where the auto turn right lane with separate signals for auto right turn & car right turn are separate . I was heading east . I had a truck turning right to my left and a car turning right behind me in the bike lane. Very ackward and unsafe especially when the truck got its signal to turn right and the bike lane signal was red. The car behind me wanted to turn right on it as well. It then has a wait for another sequence till the bike signal changed green. I never turned my head around to check but was certainly vulnerable to the car wanting to turn. Like at Michigan, refuge island layouts can always be in-filled should problems persist. As Villard is a future greenway, it could be part of any upgrade project. I really, really love the new bike lane right turn configuration on eastbound Rosa Parks at Greeley. The smart right turn signal and bicycle signal here makes all the difference in the world. It is much safer and often faster than the old design condition. no right hooks! Thank you PBOT! 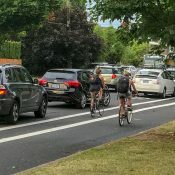 Does anyone know when the NW Naito lane repaving, restriping, and new lane configurations with cycletracks/wide bike Lanes (I forget which) is slated to happen? I’m talking about the section of NW Naito around the Fremont Bridge / Centennial Mills area. I should clarify, I guess part of the road I’m referring to is also called NW Front Ave too. The project is out to bid as we speak. Last I heard is new signals and curbs should be completed before the end of the year. This includes the new Copenhagen left-turn configuration for bikes heading from NB Naito to 9th. The repaving may slip to next year depending on weather.